Ice cream for the Crusade tonight! 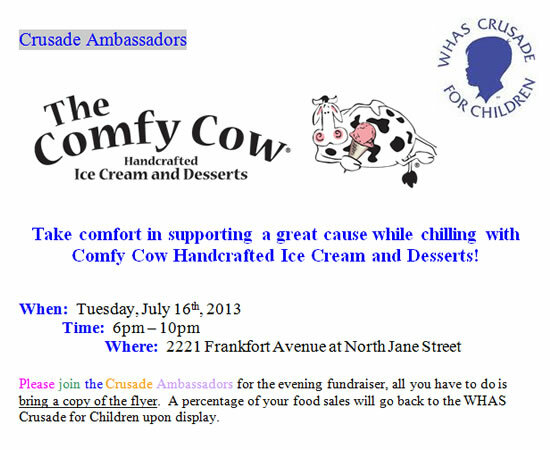 Take comfort in supporting a great cause while chilling with Comfy Cow Handcrafted Ice Cream and Desserts! Please join the Crusade Ambassadors for the evening fundraiser, all you have to do is bring a copy of the flyer. (PRINT THIS PAGE!) A percentage of your food sales will go back to the WHAS Crusade for Children upon display. Crusade Ambassadors Kick Off Jam!